Join the party in Venice! Carnival occurs every year during the period historically known as Shrovetide or pre-lent. City dwellers all around the world engage in various traditions from the spectacular to the fascinating, flaunting interesting costumes and engaging in curious traditions. The most famous carnival is held in Rio de Janeiro, but the party rages throughout Europe too! At approximately 4 am, all lights are turned off and about 200 people start making their way through the city center, carrying hand-painted lanterns. This gathering marks the start of three days of marching bands, costumed parades, and performances that fill the streets with dancing and confetti. The music is king in the carnival of Cadiz, Spain. Tens of thousands fills= the streets where wandering groups of musicians serenade the crowds with traditional music. Choirs can be heard filling the streets with sound, comparsas soothe the corners with sultry tones, and the quartets break the rules of tradition with kazoos and other whimsical sounds. 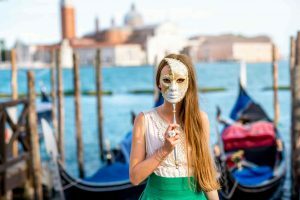 Carnival celebrations can be found all throughout the country, but the most famous is held in Venice. First recorded in 1268, this celebration is most famous for its elaborate masks. Performers and participators alike cover their face, put on a colorful hat, and dance well into the start of Lent. Speaking of masks, the ones you’ll find in Bavaria, Germany are unlike anything you’ve seen. Performers wear these doll-like masks and parade through the streets, playing music and throwing candy to celebrate the coming of Ash Wednesday. AESU offers several trips to Europe, including: Cosmopolitan, Explorer, Euro Focus, Great Escape, Viva Italia, and Euro Spree. Explore some of the greatest food and wine in Europe! This entry was posted on Wednesday, March 1st, 2017	at 12:34 pm	. You can follow any responses to this entry through the RSS 2.0	feed. Both comments and pings are currently closed.